At the start of the war in 1939 I lived in Govan and I was a member of the 108th Wolf Cub Pack which met in Drumoyne school. I don't recall what happened to this pack when the war started when so many of the cubs, like myself, were evacuated. When I returned from the evacuation in 1940(?) there were, as far as I was aware, no more active cub packs in Govan. It was not until early in 1941 that a fellow in my class at Greenfield School invited me to join the 36th Troop of the Glasgow Boy Scouts, which I did. This Troop met in the Anglican church on Greenfield St. at the corner of Langlands Rd., and I thoroughly enjoyed my short membership in this troop. I think I was a Boy Scout for only a few months, but I learned a lot about camping at Auchingillen and Arden, Loch Lomond. This was a period deep in the war and all my thoughts were filled what was happening in the war, and the Boy Scout movement, despite their salvage forays, seemed a wee bit too remote from these happenings... I was looking for something a bit more militaristic. My enthusiasm for things martial centred on the Royal Navy. I was very keen on the R.N. and would have loved to have been a sailor. I recall trying to join the Royal Navy Cadets on Whitefield Rd and being told to come back 'next year'. In 1941 an ad appeared in the Glasgow papers announcing there were going to be four new Royal Navy Cadet branches opening in Glasgow, one of which would be in the school up beside the Westway Cinema on Paisley Rd. I stood in a queue to enroll in these navy cadets; I think they were to be called "HMS Howe" (either that or the "Anson") cadets. After waiting for hours, I was finally before the recruiting officer, resplendent in his naval uniform. That's as far as Dugald got, he was told again to came back 'next year'. Dugald was of course disappointed, but totally undaunted. This tendency to things martial was not mine alone. In my class at Greenfield School there was a group of boys who were all imbued with this getting-into-uniform fad, but their interest focused more on getting into the army. This desire was encouraged by one lad, Tommy, who was already actively involved with soldiering and belonged to the 6th Btn. Highland Light Infantry ( H.L.I.) Cadet Force, which met weekly at the Headquarters for the real 6th Btn. HLI, at 60 Main St, in Bridgeton---a hundred miles from Govan. Tommy cut a real military figure when he walked down Elderpark St., in his '1914/18' uniform, swinging his kilt with the swagger of a real soldier. Since I couldn't becoming a sailor, I thought I'd join the army cadets, and allowed Tommy to talk me into joining his cadets. By the time I got around to joining, at the beginning of 1941, a Govan branch of the cadet force had been established and met in a hall, used by the Home Guard, inside the 'destructer' complex at the top of Helen St. in Govan. There were only a few of the boys who had uniforms and all the rest of the lads wore their normal short trousers. But there were great expectations for this new 'force'. The new force was under the command of a Lietenant Gordon, an ex-soldier who served with the H.L.I. in the Great War. This man was your quintessential Scottish soldier, straight as a ramrod, and very enthusiastic about soldiering. He was assisted by his second in command, Lt. Berry, a very keen and efficient man, to whom the success of the Govan force owed a great deal. These two men took us through basic foot drilling and rifle drill in the rather sparse accommodation at the destructer. We didn't have uniforms, but we had access to real weapons, well, kind of... There was a rack of rifles which I believe, belonged to the Home Guard. They were known as "Ross" rifles, and had been manufactured in Canada. They weighed a ton! Oh, they might not have been all that heavy, and perhaps it was just because we were just young boys, that they felt that way. Anyway, we also practiced rifle drill with these rifles. It could be that we did this only during the absence of our two commanders; it could have been a situation where we were handling guns, but we weren't supposed to be handling guns, I'm a bit foggy on this. The Govan cadet force didn't spend too much time at the Helen St. hall. Not long after I joined we moved into Copeland Rd. School where we could drill and practice all sorts of military craft regardless of the weather. Soon after moving here we were told to report to Headquarters in Bridgeton to get our uniforms. This was a real fun night! We lined up for ages as each boy was equipped with real current army uniforms. They gave me a kilt, which absolutely delighted me! However, I had the kilt, but everything else I had was for the British battle dress uniform and I looked absolutely stupid with the silly wee khaki forage cap, a khaki blouse with big baggy pockets, a kilt and puttees! We all dressed up as soldiers in Bridgeton, and got on the Govan tramcar at the wartime forces' reduced fare rate... wow, we were soldiers (my foot, the conductress was laughing at us!). It didn't take me long to get rid of the battle dress parts of my uniform, except for the blouse, which I had to keep. There was an army store on Oxford St. beside the police college, and I managed to get a Black Watch glengarry, a pair of white spats, a sporran, and a kilt apron. No one objected when I appeared at the first parade wearing my Black Watch glengarry with its red tassel! Clothes were rationed at this time, but we were given special clothing coupons with which we could buy heavy tackety boots. Oh boy, did I feel good walking down the street in tackety boots swinging my kilt! Not long after our cadet company were issued uniforms we went on a street parade. I'm not too sure where this parade took place, but I think it was in Bridgeton since I have a recollection of seeing the headquarters' building. We were among a couple or so new Glasgow Cadet Corp companies, and when we paraded I think it was with all the Glasgow cadet corps companies, and many of these others were all kilted and marching with their own pipe band, and they made us look like what exactly we were... untrained rookies! This 'rookie'-look didn't bother us, we were all as keen as mustard! We would wear our uniforms to school on Armistice Day, and any other such formal occasions. There were a lot pupils at the school who were in the Army Cadets, Navy Cadets or Air Training Corps, not to mention the Boys Brigade, Boy Scouts, or Girl Guides, who wore their uniforms to school. Why? Probably because there was some pleasure in being dressed on these special occasions. No doubt there was a measure of 'showing off' involved too. Some weekends during the summer we paraded out at Duntocher (between Knightswood and Milngavie-- a long way from Govan!) and went on field exercises on the wide moors there. This was great fun and we loved it... yes, crawling around in the wet grass and mud playing at soldiers was fun and it was good fresh-air exercise. We practiced field maneuvers of all kinds under the guidance of our capable officers, and learned about map-reading. (I still recall a word I learned on these maneuvers: 'copse', and I thought the officer was talking about a 'corpse' ...what the heck was a 'bushy-top corpse'?). After a day out on these moors we'd go home exhausted. Some of us, oh maybe a dozen or so, also went out to the Duntocher moors camping for the weekend and carrying out our own 'maneuvers'... no officers or anyone of authority with us. On these maneuvers we wore all kinds of pieces of military hardware that we'd picked up at the destructer. A few of us for example, had these long French bayonets from the Great War and we'd carry them, but of course we never did anything with them, but they helped with the imagination. Our tents were all pitched in military style, and we had our field-kitchen and a fire to do our cooking. (It was coming back to Govan from one of these events that the young 'Tally' woman shocked us all when she told us what she thought of Glasgow's behavior the day Italy entered the war, the same behavior of which we were a part... we were never ever quite the same after this). Some of our 'own' maneuvers took place at the River Cart near Inchinnan. At the road over stone bridge there was a Home Guard blockhouse and other concrete road blocks right beside the river, ideal for playing at soldiers. The same crowd who went to Duntocher took part in these ad hoc exercises. We took this all very seriously and when it came to plunging into the Cart at high tide, wearing full uniform, in the simulation of a commando raid, there was no backing off. Imagine running into the Cart wearing a kilt! I can still recall the discomfort of running around wearing a soaking wet kilt! (When I think of this discomfort it brings to mind the complaints at the beginning of the war when Scottish regiments were wearing the much more sensible battle-dress and no longer expected to wear kilts except on special dress-uniform occasions.). After a year or so we left the Copeland Rd. School and moved into the drill hall at the corner of Elder St. and Fairfield St. This was much better and very much a military establishment with real active service soldiers occasionally making an appearance. Real rifles of .22 calibre became available and we learned how to fire them at our indoor butts. Lots of other 'modern' equipment became available and some cadets were made to branch out into more technical aspects of the army. Well, they weren't really 'made to', one could decline any such invitation to become 'specialized'. I was one who didn't decline the 'specialized' invitation and finished up taking a course in signaling which required me to travel every Sunday afternoon to the headquarters' building in Bridgetown. I didn't mind it at first, probably because I already knew the Morse code, but when it started to require doing homework, well this wasn't what I'd had in mind; when I was told to give up my kilt because we were going on field exercises which required laying wires, I frowned somewhat on this and started to absent myself. My interest was anyway, waning of its own volition. My Army Cadet days ended shortly thereafter. We never ever did anything directly associated with the war. We didn't even collect waste-paper and scrap metal for the war effort... heaven forbid, that was the work for the Boy Scouts! There were rumours galore that we were to be used as messengers during air-raids, and also as messengers for the Home Guard if they ever became involved with defence, but these rumours never got beyond the rumour stage. 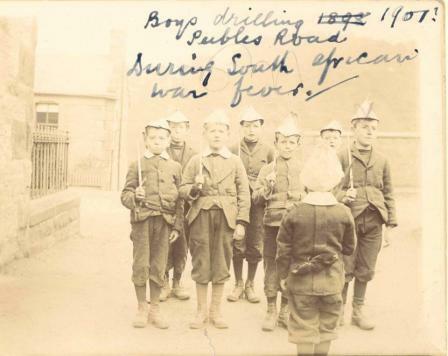 Perhaps if the war had lasted longer, a reason for having army cadets might have become apparent: we did learn parade-ground stuff and had experience in firing rifles, which might have been advantageous if we'd gone into the real H.L.I. My separation consisted simply of not going to the weekly cadet parades. Most of my cadet pals had dropped out as well. Tommy, the driving force really in our cadet group, became a real soldier, and although still a schoolboy, managed to get himself into the Home Guard; so there he was doing real maneuvers in the company of men (he finished up as a paratrooper in the real army, and no doubt he was among the very best of them, he was a sergeant-major's dream!). I finished up with no interest in the military. I still had my kilt and I kept it for a good few years, then exchanged it with my brother for a pair of bicycle racing wheels and he had it made into kilts for his daughters. As a cadet, that kilt did give me a lot of pleasure! Hello Ems: thank you for taking the time to comment on the cadet story. I'd hardly say my time in the cadets was what you referred to as 'exciting', unless wearing a kilt could be described that way, as that is probably the part I found most exciting; anyway, I'm sure your Brownie time was just as memorable. I suppose these sort of youth, and childhood, organizations have a tendency to be remembered, although I have never seen mention of the Govan cadets anywhere. And, aside from one of my pals from pre-cadet days, I don't recall chatting with any of my fellow cadets since these days. Once, while on a bike tour in Scotland and climbing over the mountain to Tignabruich, we stopped at a tourist observation point to look at the menu at the Nardini's restaurant in Largs, when I noticed the fellow who was looking through the 'penny-a-shot' binnoculars. This person had a rare skin problem, and because of this I recognized him immediately as having been a fellow cadet in Govan. I had my peep through the glasses and turned around to have a chat with the fellow, but alas he was gone. I once saw a picture of one of the fellows who'd been in our cadets in an evening paper in Glasgow. He was shown leaning out of a window of a train in the Central Station along with a couple of other lads. It seems they were on their way to accept the rank of ready-made sergeants in the Australian Army. It was during the Korean War and I guess the Aussies were looking for recruits. The pal I had from my pre-cadet days came out to Canada too, and he was best man when I got married in Toronto. We use to chat quite a bit about our glory days dressed as soldiers and had quite a few things to laugh about, and some things we didn't laugh about. What we talked mostly about was our meeting with the Italian woman in the cafe in Partick where we'd gone on one of the Sunday nights on our way from our ad lib maneuvers at Duntocher. That young woman set us all back on our heels, and it knocked a lot of soldiering enthusiasm out of us. Yes, I know, I do go on. Thank you again Ems. Cheers, duagld. I thought this would be the appropriate forum for this photo of some local heroes from Peebles road Penicuik. All enthusiastic and eager to join up during the Boer war. I wonder if they made it through WW1?